News and Events An Aspirin a Day? 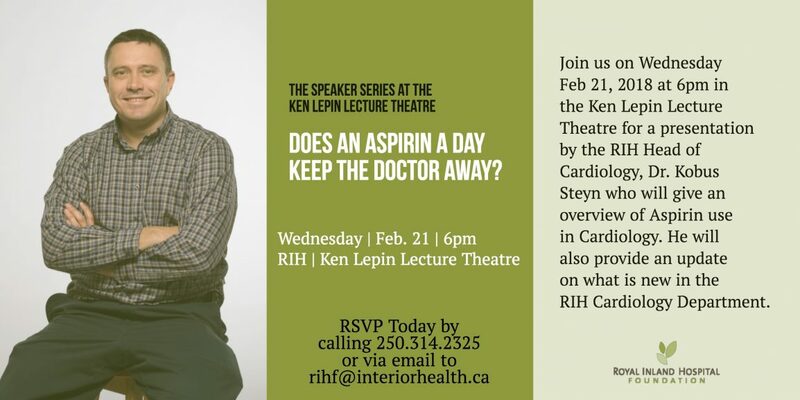 Join us on Wednesday, Feb 21, 2018, at 6 pm in the Ken Lepin Lecture Theatre for a presentation by the RIH Head of Cardiology, Dr. Kobus Steyn who will give an overview of Aspirin use in Cardiology. He will also provide an update on what is new in the RIH Cardiology Department. Wednesday, Feb 21, 2018, from 6 pm to 7 pm. Ken Lepin Lecture Theatre located in the new Clinical Services Building at RIH Level 1. To RSVP for this lecture please contact us at 250-314-2325 or email us at rihf@interiorhealth.ca.